A multinational team of scientists studying gibbons in the Chinese rainforest have discovered a new species. They have named the gibbon Skywalker. This gibbon lives mainly in the high tree tops swinging among the trees.Even though scientists have just discovered this species, they have already placed it on the endangered list. Hunting, loss of habitat, and illegal trade are sadly the main threats to its existence. Many gibbon species, which also called lesser apes, are highly endangered. Therefore, the team is thrilled to have discovered it, but worried for its future. What is the Skywalker Gibbon? The Skywalker gibbon lives at the very top of the trees in the Chinese rainforest in the country’s Yunnan Province. This province is located in the far southwest corner of China. The scientists found this species living in the Gaoligongshan Nature Reserve which is one of the most protected areas in the country. Despite this fact, the scientists still had to climb to about 8,200 feet up the mountains, because the gibbons continue moving up towards higher areas. They have already lost their habitat to hunting below that level and have no choice but to slowly move upwards. The whole trip was very demanding on the team, but they were thankful to have the opportunity to study gibbons in their natural environment. Scientists now recognize 13 species of gibbons. The Yunnan Province, where these gibbons live, is very rich in natural resources, and it is precisely the mining which constitutes a threat to their habitat. The scientists behind the discovery are afraid that the gibbons may face even more problems if miners are allowed into the forest. The mining forces plan on separating the area into smaller segments, which could prove a serious threat to the gibbons’ habitat. This new species of gibbon lives much higher off the ground than most gibbons in the area. Officially, the gibbon is called the Hoolock tianxing, but the scientists who are all Star Wars fans decided to call it the Skywalker gibbon, as a nickname. At the moment, the scientists approximate that there may only be 200 Skywalker gibbons alive. They have a different song than any other gibbons previously known, and they have more light colored hair on the top of their heads. So proud of this! First the Pez dispenser, then the Underoos & U.S. postage stamp… now this! The scientists were very careful before they announced their finding. They carried out a full physical exam. They also examined this species DNA with other known species before declaring that they had found a new type of gibbon. Scientists started to suspect that they found a new species by listening to the gibbons song. Gibbons have very loud songs. The current hypothesis on it is that they use their songs to scare away possible predators, along with attracting potential mates, marking their territory, and strengthening bonds. It’s also possible that these animals use their singing to tell other gibbons where danger lays. Since their songs will travel a long way, scientists even think that they use their singing to warn neighboring communities. Previous research noted that gibbons have regional dialects. Therefore, scientists were able to listen in the early morning hours from their camp in the rainforest. Once they identified the gibbons song, they ran through the mist to catch up with the gibbons. Over time, the scientists started recognizing that they were hearing two different songs. 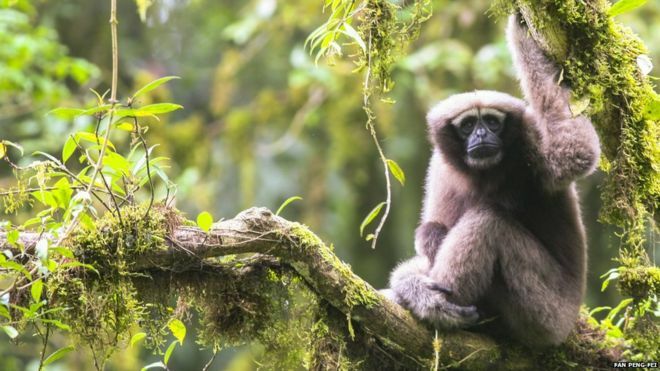 Scientists are thrilled to have discovered a new species of gibbon in the Gaoligongshan Nature Reserve in Yunnan Province, China. This brings the total number of gibbons to 13. Scientists believe that there are less than 200 of Sky Walker gibbons. They are very worried that if mining is allowed to separate the reserve into smaller patches, these rare animals that were identified by their song will be even more threatened.